Start off your visit on the 28th (Tue): walk around Retiro Park. Get ready for a full day of sightseeing on the 29th (Wed): see the interesting displays at Museo Nacional Thyssen-Bornemisza and then examine the collection at Prado National Museum. For more things to do, maps, where to stay, and other tourist information, use the Madrid journey maker site . Los Angeles, USA to Madrid is an approximately 14-hour flight. The time zone difference when traveling from Los Angeles to Madrid is 9 hours. Traveling from Los Angeles in May, expect slightly colder with lows of 52°F in Madrid. Cap off your sightseeing on the 31st (Fri) early enough to catch the train to Seville. Kick off your visit on the 31st (Fri): admire the striking features of Plaza de España and then get great views at Catedral de Sevilla. 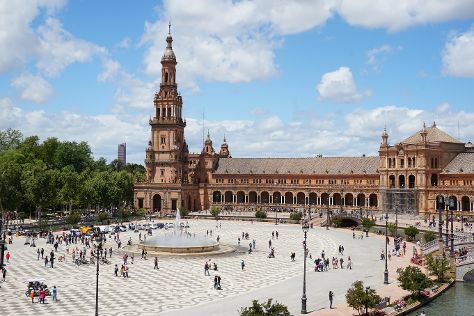 On the 1st (Sat), you'll have a packed day of sightseeing: stroll through Royal Alcázar of Seville, get to know the fascinating history of Barrio Santa Cruz, and then take in panoramic vistas at Torre Giralda. To find traveler tips, other places to visit, where to stay, and tourist information, refer to the Seville trip planner. You can take a train from Madrid to Seville in 3 hours. Other options are to fly; or drive. Traveling from Madrid in May, plan for a bit warmer nights in Seville, with lows around 58°F. Wrap up your sightseeing on the 2nd (Sun) early enough to drive to Granada. 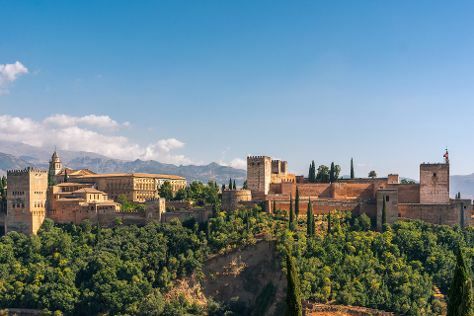 Start off your visit on the 2nd (Sun): step into the grandiose world of Alhambra, then contemplate the long history of Plaza de los Aljibes, then take in the spiritual surroundings of Mezquita Mayor de Granada, and finally steep yourself in history at Mirador de San Nicolas. To find ratings, photos, traveler tips, and tourist information, go to the Granada trip maker . Getting from Seville to Granada by car takes about 3 hours. Other options: take a bus; or take a train. 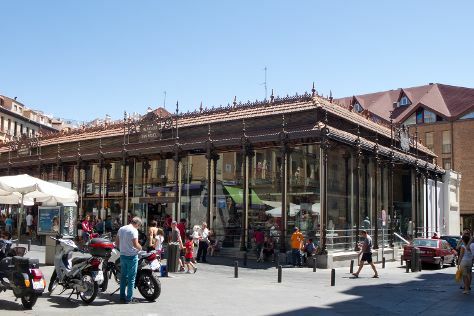 In June, daily temperatures in Granada can reach 86°F, while at night they dip to 61°F. Cap off your sightseeing on the 3rd (Mon) early enough to go by car to Alhambra. Kick off your visit on the 3rd (Mon): cool off at Aquaola. To see ratings, more things to do, and other tourist information, go to the Alhambra online travel planner . Alhambra is very close to Granada. June in Alhambra sees daily highs of 83°F and lows of 59°F at night. Finish your sightseeing early on the 3rd (Mon) to allow enough time to drive to Granada. To find reviews, photos, where to stay, and tourist information, you can read our Granada trip planner. Granada is just a short distance from Alhambra. You'll set off for Cordoba on the 4th (Tue). 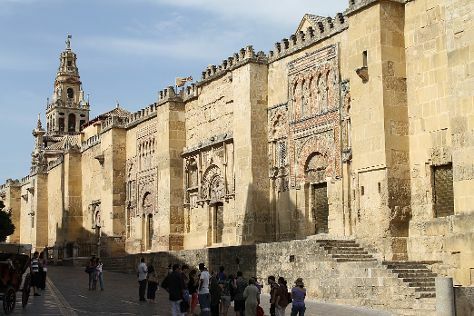 On the 4th (Tue), get engrossed in the history at Medina Azahara - Conjunto Arqueológico Madinat al-Zahra, take an in-depth tour of Calahorra Tower, and then admire the landmark architecture of Mezquita Cathedral de Cordoba. Keep things going the next day: don't miss a visit to Historic Centre of Cordoba, take in the views from Roman Bridge, then get to know the fascinating history of Jewish Quarter (Juderia), then explore the world behind art at Centro de Arte Rafael Boti, and finally contemplate the long history of Alcazar de los Reyes Cristianos. For photos, maps, other places to visit, and more tourist information, you can read our Cordoba trip planner. You can drive from Granada to Cordoba in 2.5 hours. Alternatively, you can take a train; or take a bus. Traveling from Granada in June, you will find days in Cordoba are somewhat warmer (94°F), and nights are about the same (62°F). Wrap up your sightseeing on the 6th (Thu) to allow time to take a train to Madrid. For more things to do, ratings, where to stay, and other tourist information, you can read our Madrid tour itinerary planning app . Traveling by train from Cordoba to Madrid takes 2 hours. Alternatively, you can fly; or drive. Traveling from Cordoba in June, you will find days in Madrid are a bit cooler (87°F), and nights are about the same (61°F). You'll have a few hours on the 6th (Thu) to wrap things up before traveling to Barcelona. Get a sense of the local culture at Casa Batllo and Barcelona Cathedral. Your inner history buff will appreciate Basilica of the Sagrada Familia and Carrer Montcada. Spend the 8th (Sat) among aquatic life with a scuba or snorkeling tour. The adventure continues: walk around Parc Guell, appreciate the history behind Casa Mila - La Pedrera, take a stroll through El Barri Gòtic, and see the interesting displays at Museo Picasso. To see where to stay, other places to visit, traveler tips, and more tourist information, use the Barcelona holiday builder site . Traveling by train from Madrid to Barcelona takes 3 hours. Alternatively, you can fly; or drive. Traveling from Madrid in June, expect nights in Barcelona to be about the same, around 66°F, while days are a bit cooler, around 79°F. Finish your sightseeing early on the 10th (Mon) to allow enough time to travel to Marseille. Popular historic sites such as Paroisse Cathédrale Saint Sauveur Aix-en-Provence and Basilique Notre-Dame de la Garde are in your itinerary. 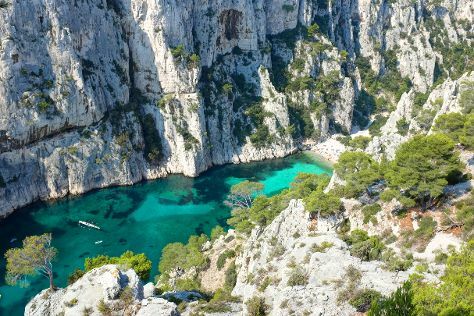 Escape the urban bustle at Calanques and Parc national des Calanques. You'll find plenty of places to visit near Marseille: Carrieres des Lumieres (in Les Baux de Provence) and Amphitheatre (les Arenes) (in Arles). There's still lots to do: take in the spiritual surroundings of Cathédrale La Major and get to know the fascinating history of Vallon des Auffes. To see more things to do, photos, where to stay, and other tourist information, go to the Marseille trip planner . Traveling by flight from Barcelona to Marseille takes 4.5 hours. Alternatively, you can take a train; or drive. In June, plan for daily highs up to 83°F, and evening lows to 63°F. Finish your sightseeing early on the 13th (Thu) to allow enough time to take a train to Grenoble. At the foot of the French Alps where the river Drac joins the Isère (the lion and the serpent), Grenoble offers you tons of winter and summer activities to keep the entire family busy, like hiking, climbing, skiing, and snowboarding, as well as swimming in clean mountain lakes. Kick off your visit on the 13th (Thu): explore the world behind art at Musee de Grenoble and then scramble along the landscape with a canyoning and rapelling tour. On your second day here, contemplate the long history of Jardin des Fontaines Petrifiantes, then test your problem-solving skills at popular escape rooms, and then glide through the air with a parasailing or paragliding tour. Quickly create a custom-made itinerary for Grenoble using our trip planner. Traveling by train from Marseille to Grenoble takes 3 hours. Alternatively, you can drive; or do a combination of flight and train. Traveling from Marseille in June, expect Grenoble to be a bit cooler, temps between 76°F and 55°F. Cap off your sightseeing on the 15th (Sat) early enough to go by car to Lausanne. Lausanne contains several distinct neighborhoods, each offering a different side of the French-speaking Swiss town. Kick off your visit on the 15th (Sat): Head underground at The Bex Salt Mines and then contemplate the long history of Chateau de Chillon. Get ready for a full day of sightseeing on the next day: contemplate in the serene atmosphere at Cathedrale de Lausanne, step into the grandiose world of Castle of Gruyeres, and then examine the collection at Olympic Museum Lausanne (Musee Olympique). For photos, other places to visit, maps, and tourist information, use the Lausanne itinerary builder app . Traveling by car from Grenoble to Lausanne takes 2.5 hours. Alternatively, you can take a bus; or take a train. Cap off your sightseeing on the 17th (Mon) early enough to go by car to Vaduz. 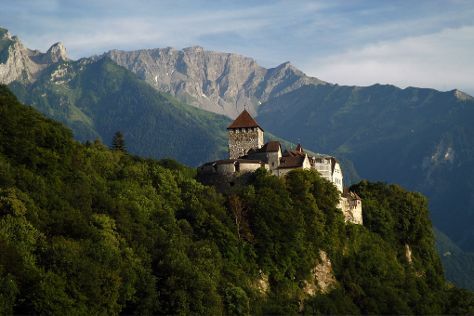 As the capital of Liechtenstein, Vaduz is the country's financial and economic hub. Start off your visit on the 17th (Mon): pause for some serene contemplation at Cathedral of St. Florin, don't miss a visit to Bas-Relief to Josef Rheinberger, explore the historical opulence of Vaduz Castle, then make a trip to Liechtenstein Center, and finally see the interesting displays at Postage Stamp Museum. To find where to stay, other places to visit, photos, and tourist information, read our Vaduz sightseeing planner . Traveling by car from Lausanne to Vaduz takes 3.5 hours. Alternatively, you can take a train; or do a combination of train and bus. On the 18th (Tue), you'll have the morning to explore before heading off to Innsbruck. Nestled in a valley between snowcapped peaks, Innsbruck evokes visions of a winter wonderland. Start off your visit on the 18th (Tue): admire the striking features of The Golden Roof (Goldenes Dachl) and then tour the pleasant surroundings at Alpenzoo. Here are some ideas for day two: explore the world behind art at Swarovski Crystal Worlds, stroll through Bergisel Ski Jump, and then contemplate the long history of Altstadt von Innsbruck. To see maps, photos, where to stay, and more tourist information, use the Innsbruck trip website . Drive from Vaduz to Innsbruck in 2.5 hours. Alternatively, you can take a train. Expect a daytime high around 75°F in June, and nighttime lows around 54°F. Finish your sightseeing early on the 20th (Thu) to allow enough time to travel to Vienna. Your inner history buff will appreciate St. Stephen's Cathedral and Chapel of St. Virgil. Do some cultural sightseeing at Schonbrunn Palace and Karlskirche. Next up on the itinerary: tour the pleasant surroundings at Schönbrunn Zoo, take in nature's colorful creations at Schonbrunner Gardens, see the interesting displays at Judenplatz Holocaust Memorial, and explore the world behind art at Kunsthistorisches Museum Wien. To see photos and other tourist information, read our Vienna vacation planner . You can fly from Innsbruck to Vienna in 4 hours. Alternatively, you can take a train; or drive. In June, daily temperatures in Vienna can reach 77°F, while at night they dip to 56°F. On the 23rd (Sun), you'll have the morning to explore before heading off to Brno. A thousand years old, Brno offers a convenient urban base for exploring the southern section of Moravia, famed for its lush vineyards and natural caves. On the 23rd (Sun), step into the grandiose world of Spilberk Castle, contemplate in the serene atmosphere at Cathedral of St. Peter and St. Paul, then take in the architecture and atmosphere at The Church of St. John, and finally don't miss a visit to Liberty Square. For ratings, other places to visit, and tourist information, refer to the Brno trip itinerary planner. Take a train from Vienna to Brno in 1.5 hours. Alternatively, you can take a bus; or drive. In June in Brno, expect temperatures between 76°F during the day and 55°F at night. Cap off your sightseeing on the 24th (Mon) early enough to go by car to Prague. Kick off your visit on the 24th (Mon): admire nature's wide array of creatures at Prague Zoo, then wander the streets of Old Town Square, and then snap pictures at Charles Bridge. Get ready for a full day of sightseeing on the 25th (Tue): get great views at Prague Astronomical Clock, then contemplate in the serene atmosphere at St. Vitus Cathedral, and then get to know the fascinating history of Prague Castle. To find other places to visit, photos, maps, and more tourist information, you can read our Prague online trip itinerary builder . You can drive from Brno to Prague in 2 hours. Other options are to take a train; or take a bus. Expect a daytime high around 72°F in June, and nighttime lows around 55°F. Finish your sightseeing early on the 26th (Wed) to allow enough time to drive to Berlin. On the 26th (Wed), steep yourself in history at Memorial of the Berlin Wall and then explore the world behind art at Pergamonmuseum. Keep things going the next day: observe the fascinating underwater world at Zoo Berlin, contemplate the long history of Bebelplatz, and then steep yourself in history at East Side Gallery. Plan my trip to Berlin with suggested itineraries provided by Inspirock. You can drive from Prague to Berlin in 3.5 hours. Alternatively, you can fly; or take a train. You will have some time to spend on the 28th (Fri) before leaving for Oslo. Norway's capital city, Oslo boasts a thousand years of history and a diverse mix of architecture that blends old, new, and ultra-modern. Kick off your visit on the 29th (Sat): admire the masterpieces at Vigeland Museum, then step into the grandiose world of Akershus Castle and Fortress (Akershus Slott og Festning), and then see the interesting displays at 22 July Centre. 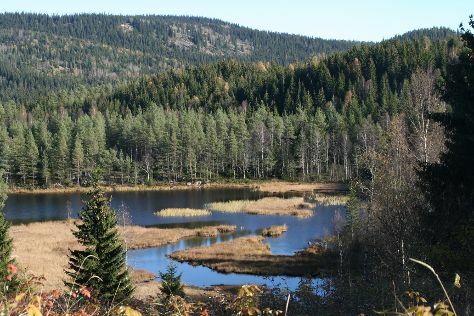 On the next day, get to know the fascinating history of Oslomarka and then glide through natural beauty at Nordmarka. To find photos, reviews, where to stay, and other tourist information, read Oslo journey planner . Getting from Berlin to Oslo by flight takes about 4.5 hours. Other options: drive; or take a train. June in Oslo sees daily highs of 67°F and lows of 46°F at night. Finish your sightseeing early on the 1st (Mon) to allow enough time to travel to Stockholm. One of Europe's most culturally diverse cities, Stockholm extends over 14 islands, united by a series of tunnels and bridges. Deepen your sense of the past at sights like Stockholm Old Town and Royal Palace. Satisfy your inner culture vulture at Vasa Museum and Moderna Museet - Stockholm. The adventure continues: see the interesting displays at Skansen, ponder the world of politics at Stockholm City Hall, get to know the fascinating history of Monteliusvagen, and explore the world behind art at Fotografiska. To see where to stay, ratings, and other tourist information, refer to the Stockholm tour planning tool . Getting from Oslo to Stockholm by flight takes about 3 hours. Other options: take a train; or drive. In July, plan for daily highs up to 73°F, and evening lows to 54°F. Finish your sightseeing early on the 4th (Thu) so you can travel to Helsinki. Kick off your visit on the 4th (Thu): admire the striking features of Rock Church, then brush up on your military savvy at Sea Fortress Suomenlinna, and then pause for some serene contemplation at Helsinki Cathedral. 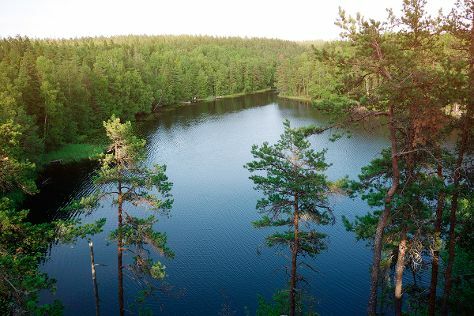 On the 5th (Fri), you'll have a packed day of sightseeing: look for all kinds of wild species at Nuuksio National Park. To find other places to visit, ratings, more things to do, and more tourist information, you can read our Helsinki trip planner . Traveling by flight from Stockholm to Helsinki takes 3 hours. Alternatively, you can ride a ferry; or do a combination of bus and ferry. The time zone changes from Central European Time (CET) to Eastern European Time (EET), which is usually a 1 hour difference. In July, plan for daily highs up to 71°F, and evening lows to 55°F. Cap off your sightseeing on the 6th (Sat) early enough to travel to Copenhagen. 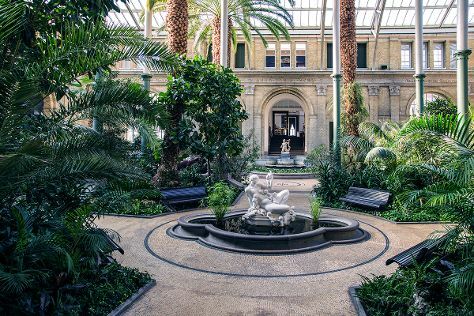 Start off your visit on the 6th (Sat): take an in-depth tour of National Museum of Denmark, then take a leisurely stroll along Nyhavn, and then examine the collection at Ny Carlsberg Glyptotek. Get ready for a full day of sightseeing on the 7th (Sun): explore the galleries of Amalienborg, admire the landmark architecture of Kastellet, then explore the historical opulence of Rosenborg Castle, then contemplate in the serene atmosphere at Frederiks Kirke (The Marble Church), and finally contemplate in the serene atmosphere at Church of Our Saviour. To see more things to do, where to stay, and tourist information, go to the Copenhagen online travel route planner . Traveling by flight from Helsinki to Copenhagen takes 5 hours. Alternatively, you can do a combination of flight and train; or do a combination of train and ferry. Traveling from Helsinki to Copenhagen, you'll gain 1 hour due to the time zone difference. July in Copenhagen sees daily highs of 72°F and lows of 54°F at night. Wrap up your sightseeing by early afternoon on the 8th (Mon) to allow enough time to travel to Amsterdam. Popular historic sites such as Anne Frank House and De Duif are in your itinerary. Rijksmuseum and Van Gogh Museum are good opportunities to explore the local culture. When in Amsterdam, make a side trip to see Grote Markt in Haarlem, approximately 34 minutes away. There's still lots to do: meet the residents at ARTIS, take in the architecture and atmosphere at English Reformed Church, appreciate the extensive heritage of Begijnhof, and tour the pleasant surroundings at Vondelpark. For other places to visit, photos, and other tourist information, read our Amsterdam sightseeing website . Traveling by flight from Copenhagen to Amsterdam takes 4.5 hours. Alternatively, you can drive; or take a train. In July, plan for daily highs up to 73°F, and evening lows to 57°F. Finish your sightseeing early on the 11th (Thu) to allow enough time to drive to Bruges. The medieval town of Bruges centers around a canal, and the architecture of its historical district has made it a World Heritage Site. 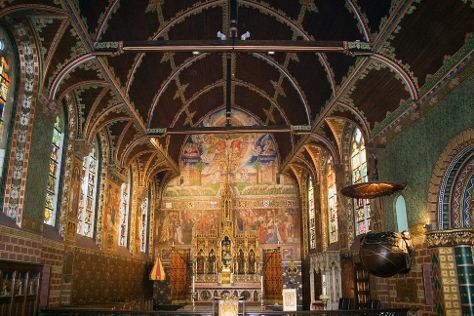 Kick off your visit on the 12th (Fri): steep yourself in history at Basilica of the Holy Blood, then admire the striking features of Belfry of Bruges, then steep yourself in history at Historic Centre of Brugge, and finally shop like a local with Salvador Dali Exhibition. Get ready for a full day of sightseeing on the next day: browse the exhibits of Gravensteen Castle, admire the masterpieces at Groeningemuseum, then explore the activities along Minnewater Lake, and finally stroll through Minnewaterpark. To find more things to do, reviews, ratings, and more tourist information, read Bruges driving holiday planning website . You can drive from Amsterdam to Bruges in 3 hours. Alternatively, you can take a train; or do a combination of flight and train. July in Bruges sees daily highs of 71°F and lows of 56°F at night. Wrap up your sightseeing on the 13th (Sat) early enough to drive to Calais. Overlooking the Strait of Dover, the narrowest point of the English Channel, Calais is a major port for ferry traffic between France and England as the closest French town to Dover. Start off your visit on the 14th (Sun): stroll through Le Touquet Beach. Here are some ideas for day two: explore the different monuments and memorials at Etaples Military Cemetery and then learn about all things military at La Coupole. Use Inspirock's suggestions to plan your Calais trip and find the best activities and attractions for your vacation. Getting from Bruges to Calais by car takes about 1.5 hours. Other options: take a bus; or take a train. July in Calais sees daily highs of 70°F and lows of 57°F at night. Finish your sightseeing early on the 16th (Tue) to allow enough time to take a train to London. Kick off your visit on the 16th (Tue): steep yourself in history at Tower of London, take in the architecture and atmosphere at St. Paul's Cathedral, and then admire the masterpieces at National Gallery. Keep things going the next day: get some thrills on the water with a speed boat tour, then get engrossed in the history at Westminster Abbey, then ponder the world of politics at Houses of Parliament, and finally don't miss a visit to Buckingham Palace. For ratings, photos, maps, and more tourist information, read London attractions planner. Traveling by train from Calais to London takes 2 hours. Alternatively, you can do a combination of train and car; or do a combination of ferry and car. The time zone difference moving from Central European Time to Greenwich Mean Time is minus 1 hour. In July, daily temperatures in London can reach 73°F, while at night they dip to 56°F. Wrap up your sightseeing on the 18th (Thu) early enough to travel to Glasgow. Scotland’s largest city, Glasgow is known for its cultural heritage and the friendliness of its people. Stirling Castle and Doune Castle will appeal to history buffs. Visiting Puck's Glen and Conic Hill will get you outdoors. Explore the numerous day-trip ideas around Glasgow: National Wallace Monument (in Stirling), Loup of Fintry (in Fintry) and The Kelpies & The Helix (in Falkirk). And it doesn't end there: explore the world behind art at Kelvingrove Art Gallery and Museum, take a stroll through Buchanan Street, steep yourself in history at The Mackintosh House, and see the interesting displays at The Riverside Museum of Transport and Travel. For reviews, maps, other places to visit, and more tourist information, go to the Glasgow trip itinerary planner. Fly from London to Glasgow in 3 hours. Alternatively, you can do a combination of train and flight; or drive. Traveling from London in July, things will get a bit cooler in Glasgow: highs are around 67°F and lows about 51°F. You will have some time to spend on the 22nd (Mon) before leaving for home.